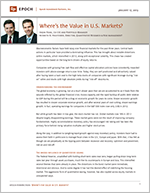 Where’s the Value in U.S. Markets? - Epoch Investment Partners, Inc.
Where’s the Value in U.S. Markets? Macroeconomic factors have held sway over financial markets for the past three years. Central bank actions in particular have provided a dominating influence. This has brought about notable distortions within markets, which intensified in 2012, along with exceptional volatility. This chaos has created opportunities based on the long-term drivers of equity returns. Companies with growing free cash flow and effective capital allocation policies have consistently rewarded investors with above-average returns over time. Today, they are well positioned and attractively valued after having taken a back seat to the high-beta stocks of companies with significant leverage during “risk-on” rallies and stocks with high absolute yields during “risk-off” downturns. The global economy is growing, but at a much slower pace than we are accustomed to as it heals from the wounds inflicted by the global financial crisis. Excess capacity and the rapid buildup of public debt relative to GDP during this period will be a drag on economic growth for years to come. Slower economic growth has resulted in slower corporate revenue growth, and after several years of cost cutting, slower earnings growth. In fact, operating earnings for companies in the S&P 500 Index rose only 2.6% in 2012.
fundamentals. Highly accommodative monetary policy has encouraged risk taking and has been the primary force behind rising valuation multiples and higher stock prices. Along the way, in addition to weighing tepid growth against easy monetary policy, investors have had to assess their faith in politicians to manage fiscal crises in the U.S., Europe and Japan. With that, it has felt as though we are perpetually at the tipping point between recession and recovery; optimism and pessimism; risk-on and risk-off. The Federal Reserve, unsatisfied with holding short-term rates near zero, began pulling down long-term rates last year through asset purchases, much like its counterparts in Europe and Asia. This intensified several themes that were already in place. The distortions in the bond market were immediate, intentional and obvious. And to some degree it has had the desired effect of stabilizing the housing market. This aggressive form of quantitative easing, however, has also rippled across equity markets in unexpected ways. During risk-on periods, the best performing stocks belonged to companies with weak balance sheets where the reduced cost of capital had a huge influence on their prospects, and in some cases, their survival. During risk-off periods, stocks with high yields reigned, regarded as bond substitutes in a flight to “safety.” But there is nothing safe about an equity security in cases where the high level of yield is a product of an aggressive payout ratio and little cash flow growth to support it. The chart below (figure 1) illustrates the attraction to yield and simultaneous indifference to free cash flow. Usually, companies with high free cash flow pay the highest sustainable dividends. But in the recent period, paying a high dividend mattered more to a company’s stock price than having the cash to cover it. Relative Return of Free Cash Flow to Enterprise Value Within the Highest Quintile of Dividend Yield,1964 Through Early-December 2012. Source: Empirical Research Partners Analysis. December 2012. Large capitalization stocks measured over one-year holding periods. Another way to look at this phenomenon is to compare dividend yield to dividend growth, which is usually correlated with free-cash-flow growth. The next chart (figure 2) illustrates how investors have favored absolute dividend yield over dividend growth in 2012, more than at any other time except for a similar period immediately following the financial crisis. The health care sector has been a microcosm for the broader market. In the first and third quarters of 2012 (both risk-on quarters) the best-performing industry was the most speculative: biotechnology. During the second quarter (a risk-off quarter) the best-performing industry was pharmaceuticals. “Big Pharma” is renowned for generous dividend yields. It is also well known that patents will be expiring for key drugs over the next three years, leading to concerns about falling revenues. Historically, we have largely avoided pharmaceutical and biotechnology companies (with a small number of exceptions) and have instead positioned the portfolio in health care services which is experiencing above-average revenue growth. We believe a number of health care service providers will provide attractive returns based on improving revenue in a world where economic growth is slow and revenue growth is scarce. Ratio of trailing P/Es for Highest Quintile of Dividend Growth Versus Highest Quintile of Dividend Yield. Source: Corporate Reports, Empirical Research Partners Analysis. Capitalization-weighted data for large-capitalization U.S. stocks from 1952 through mid-September 2012. Additional illustrative examples of our unusual times can be found among money-center banks. These opaque organizations have generally weak balance sheets and dubious cash flow, and they owe “earnings improvements” over the past two years largely to a reduction in reserves for bad loans. Yet they were among the top-performers in 2012 as beneficiaries of quantitative easing. Cash-flow-oriented investors, including ourselves, have tended to avoid the big banks in favor of a variety of non-bank financials. These include fee-based asset managers, insurance services, and exchanges that should see higher volumes as a result of new regulations. Disparate factors have been associated with U.S. equity market returns during different risk-on and risk-off quarters along with shifting views on the global economy and the euro zone’s sovereign debt crisis. The table below (figure 3) provides another view of the market distortions brought on by central bank policies. Ranked by Returns Among 22 Factors Source: Nomura Securities International, Inc. Notes: The Russell 1000 stocks are ranked according to a particular factor. Factor returns are generated by calculating the subsequent performance of an equal-weighted portfolio that is long the highest decile and short the decile with the lowest score (rebalanced monthly). Factor returns do not include transaction costs. Long-term annualized returns represent the 20-year period ended December 2012.
lights from their work. In the first and third quarters of 2012 (risk on) companies with high levels of beta and default risk were the clear winners. During the second quarter (risk off) a high absolute level of dividend yield was associated with strong returns. While investors sought to cushion returns with high dividend yields in this period, it was not what we would consider a flight to quality, as evidenced by EBITDA/EV. In all three of those quarters EBITDA/EV, which is considered a proxy for free cash flow, lagged considerably, coming in dead last as an explanatory factor in the third quarter. Yet, over time, this factor is the most reliable in terms of driving equity returns. We think a consistent approach that focuses on free cash flow will be more reliable over time than chasing market leadership, which proved an enormously difficult task in 2012, even for macro-oriented money managers. In the fourth quarter, U.S. stocks were flat and the factor rankings did not fall as neatly as in previous quarters. While too early to tell, this may indicate that the unusually strong influence of macro factors is beginning to subside. If so, we would expect equity returns to become increasingly dependent on company fundamentals. One advantage that companies with strong free cash flow have is the ability to reinvest in their business. If the expected return on an investment is greater than the company’s cost of capital, it makes sense to invest for future growth. In the current environment, however, there has been an unusually high level of political and economic uncertainty. This has caused investors to be especially skeptical about management’s ability to identify projects that will drive growth and add value. The next chart (figure 4) illustrates that companies have been penalized for investing, especially if they have superior cash flows. The light orange bars show the relative returns for the Russell 1000 constituents when broken down into quintiles by capital expenditures/enterprise value. The biggest spenders underperformed. What is striking is that this phenomenon is even more pronounced for the top 200 companies in terms of EBITDA/EV (the dark orange bars), which is a proxy for cash flow. In other words, the more successful a company has been in terms of generating cash flow, the more it has been punished for making investments. That doesn’t square with our thinking, but this could persist until we pass through this period of unusually high uncertainty. While ultra-low interest rates and asset purchases by the world’s major central banks may be with us for some time, we do not think valuation multiples have much room to expand further without an underlying improvement in company fundamentals. So, unlike 2012, where central bank action pushed up prices for speculative companies and turned high-yielding stocks into bond substitutes, we expect the next several years to provide more muted returns, driven by companies with improving revenue and cash flow generation. This is where we see opportunity in U.S. equity markets today. Companies that have proven they can grow free cash flow and allocate it effectively should provide attractive returns, especially in an environment of slow growth. Yet they have badly lagged the broader market, especially in 2012. Economically sensitive sectors in particular have underperformed. Industrials, consumer discretionary and technology companies have generally had meaningful revenue growth, yet many have seen their valuation multiples contract in contrast to the broader market trend. Relative Returns of Capital Spending to Enterprise Value Within the Russell 1000 Index and Within the Top Quintile of EBITDA/EV. Source: Bureau of Economic Affairs, Congressional Budget Office and Epoch Investment Partners. Monthly equal weighted returns for 2012. Companies with cash will use it to create value, by reinvesting in the growth of their business, making accretive acquisitions or returning it to shareholders through dividends, stock buybacks or deleveraging. They can control their destiny without having to look to banks or capital markets for financing. Uncertainty about the economy and about tax rates has led to caution and skepticism among corporations, marked by a low level of M&A and the hoarding of cash. The Economic Policy Uncertainty Index1, which goes back nearly three decades, remains elevated after hitting an all-time peak in 2011. But that uncertainty will gradually lift. Businesses will be better able to plan for expansion, and cash will be deployed. Companies with superior balance sheets and free cash flow are best positioned to generate profits in a slow-growth environment. And as central bank policies test their limits, stock prices will be influenced less by macroeconomic forces and more by company fundamentals. Therefore, we expect a consistent approach to investing in high-quality, cash-generating businesses with sound capital allocation policies to provide superior results in the coming years.